USAnswer acquires Maine Business Center and now offers Quality Physical Office Space, along with our powerful Virtual Offices, in our home town of Portland, Maine and beyond. Est in 2003, Maine Business Center was of the first multi-tenanted office facility in town! Give us a call or stop by anytime, Monday through Friday 8:00 AM to 6:00 PM for a free tour. 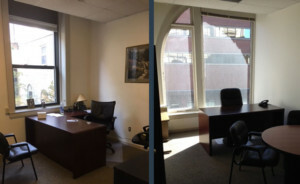 Fully furnished office with a phone, high back chair, desk and (2) guest chairs. 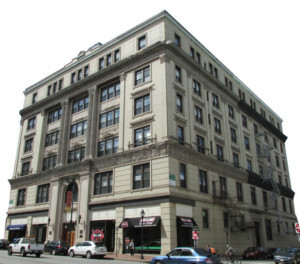 Save thousands by setting up Portland Maine Executive Office! Maybe you are starting up a new business or downsizing an existing one, with the Corporate Identity Package you will be able to maintain a downtown Portland presence without the physical office. Our professional receptionist will answer your company phone and transfer inquires directly to you wherever you are or into your voicemail box. Your clients will have the impression that we are your personal office staff. You get your own phone number with live telephone answering from 9:00am – 5:00pm Monday – Friday except holidays. 24-hour voicemail. Have your calls directed to you anywhere on the planet. You could be out fishing in a boat or on top of a mountain. No matter where you are you will never miss an important phone call. You may also use our 415 Congress Street address if you wish for business cards, yellow page ads, promotions, etc. You will be required to pick-up your mail with this package. Look BIGGER than you actually are for only $75 per month! You get your own phone number with live telephone answering from 9:00am – 5:00pm Monday – Friday except holidays. 24-hour voicemail. Have your calls directed to you anywhere on earth. You could be at a business lunch or in your car. No matter where you are you will never miss an important phone call. You also get full use of a prestigious 415 Congress Street address (right next to City Hall in Portland). Use it on your business cards or advertising and have your mail come to this address. We will then forward your mail directly to you. For $150 a month you will be the talk of the town! The hot-desk package provides you with a great corporate image and access to full office support. Each hot-desk comes with a desk and 1 or 2 chairs. They are available by the hour, day, week or month. Call today & we’ll make you a deal you can’t refuse. Kitchen w/ snack machines, complementary spring water & coffee. Access to Color copier/ Scan/ Fax and shredding machines as needed. 10 hours of our video-conference room use per month. 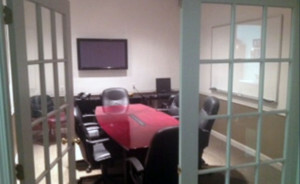 Our conference room has a table that fits 8 high-back leather chairs, a white board and 42″ plasma television. Thus providing great presentations via web & video conference. This conference room is reserved for current physical and virtual tenants, but If you are not a physical tenant & need a conference room for an hour, day, a week or year give us a call at 866-254-0040! A great deal for a small business that doesn’t have a lot of capital and is bootstrapping it, You can get all you need and then some at MBC: A#1 front office reception staff. 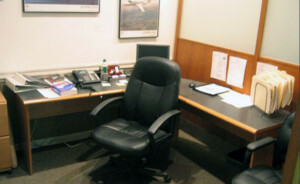 desk, phone, comfortable waiting area and video conference room. To be able to move in and have everything there, it’s like a dream come true for a small business owner. The key benefit to me at the Maine Business Centers is flexibility….if you need it they can do it. I needed a wireless connection and they had it up in a week. I needed to do a web conference and they had it setup in minutes. This is incredibly important for startups and entrepreneurs with limited resources. 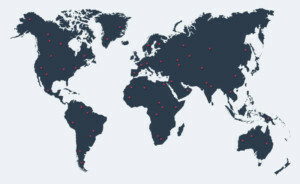 My customers are Vice Presidents of Global 2500 companies. The downtown Portland address and the administrative assistant answering my phone as HazTrack is critical when these people call. Maine Business Centers itself is a startup and I believe that their mindset is what makes the facility outstanding. I have been involved with other incubators including www.garage.com and www.cambridgeincubator.com, and with the exception of capital resources (investor involvement), the PBC is in the same class, which is incredible given the size of the technology community here in southern Maine. I moved my business up here from Manhattan where I was paying $18,000 a month for the same services that Maine Business Centers provides. The speed of the Internet here at Maine Business Centers is nothing short of incredible. I’m able to continue working with my clients in Manhattan and have started a new venture to boot. I just wanted to thank you and your staff for the extra special attention that was dedicated for my companies meeting yesterday. I was told that your facility was perfect for their days agenda and that your facility was very professional and was state of art in having all the necessary requirements for a business meeting. I hope to work with you again in the future and thanks again! A business center that was found on a website turned out to be a wonderful experience for all involved.